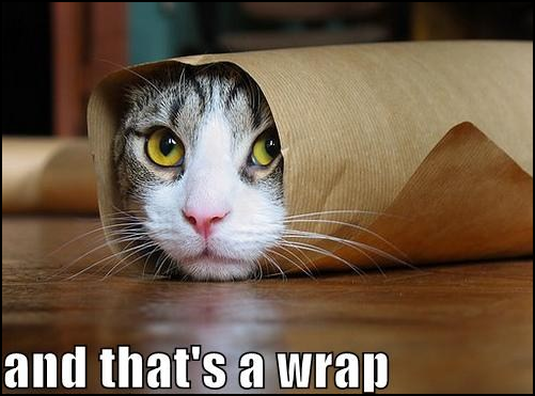 Aren’t we all just a cat, wrapped up in brown paper, waiting to swipe at the next thing that wanders by, asking them to love us? 2017 was…well, how can I even describe it accurately? I’m not talking about the barrage of bizarre world events (most of which I’d like to block out with a bottle of wine and a Xanax chaser ), I mean how things steam-rolled along here at Experience Wine Tours. “Busy”, “transformative”, “jarring”, “incredible”…these are words that come to mind. The year just blew by, days blending into one another; first with our grey and chilly Spring, when it seemed that the colour green would never return to the world; then our challenging ‘floods vs fires’ blazing hot Summer; followed by a beautifully warm and colourful Autumn, which was so rudely and forcefully halted on Nov 3 with an early snowfall. Tour-wise, it was very, very busy, and through it all, our team of talented staff just kept on delivering memorable experiences to our guests. Most importantly, allow me to say this: we are so very, very blessed. Thanks to you — our readers, our friends, our industry partners, and our tour guests — we had a simply outstanding 2017. The industry continues to change and grow, and we look forward to what 2018 has in store for us all! 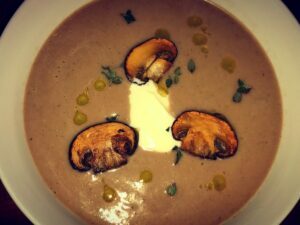 Matt’s Winter Mushroom Soup — DELISH! This is the last Wine Blog post of 2017 for us. So, while it’s short and sweet, I will use this opportunity for a little shameless promotion! Our first ever Newsletter, The Grapevine, launched earlier this month. In it, we included several of Matt’s Wine Picks along with some fabulous winter recipes in our Soul Food section that we encourage you to try out! If you’d like to sign up for The Grapevine, which is delivered quartlery (next one coming in March) you can click here to do so. A special reminder that we operate tours year-round! 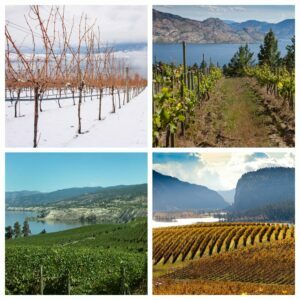 Our Kelowna Winter Tour is a fantastic way to break the monotony of grey days this winter, and our new Favourite Things tour is a perfect opportunity for locals and visitors alike to check out some of our favourite spots in Kelowna, whilst eating and drinking your way through the day. Kind of epic, by the way. Wear pants with an elastic waist band. Finally: if you’re still stuck for gift ideas, ain’t nobody mad at finding a Gift Card from Experience Wine Tours under the tree! There is still time! We’d also like to take this opportunity to wish you the best of the Holiday Season. Whether you celebrate Christmas, Hanukkah, Kwanzaa, “Festivus for the Rest of Us”, or nothing at all…thank you again so much for being a part of our journey through 2017. You made it all worth it! We hope to see you in 2018.